Our first little goldfish swimming laps in their olympic sized pool, a.k.a. the horse trough. So I bee bopped home and told Cowboy of my newfound knowledge. And if you could have seen the look on his face. Let’s just pull a line out of his favorite TV show, and say, “Well, possum on a gum bush.” So we started asking around, and sure enough it’s a REAL thing. We went about purchasing goldfish at a whopping 32 cents a piece and gave it a try. Admittedly, fall into winter was probably not our smartest time to try, but we gave it a good go. Sure enough, it worked. Well, kind of. Enter Lips. In our last batch of fish, we got one little fella who was all gold with the exception of bright white lips. So while I had avoiding naming the fish, this one was special. And you guessed it, his name is Lips. 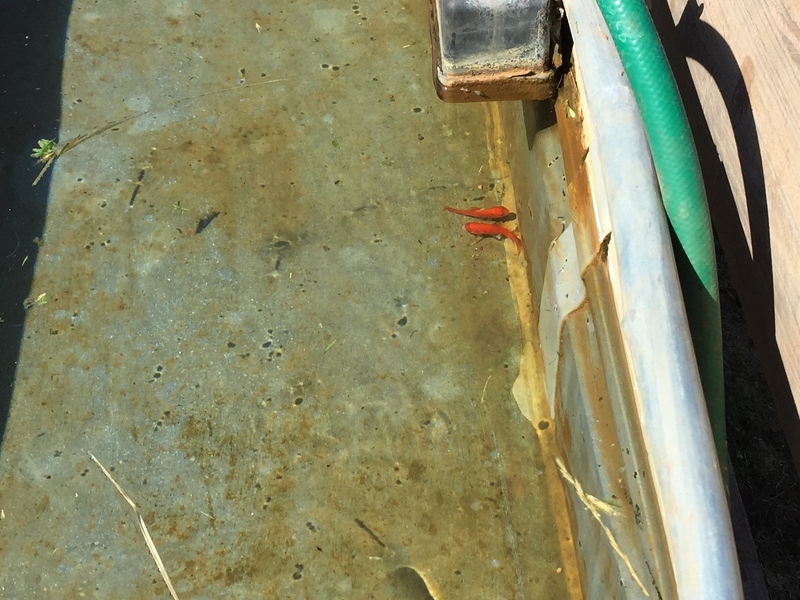 I’d read that sometimes goldfish don’t always do well in galvanized tanks, so I thought maybe this was his problem. I scooped him out and put him in a sassy purple horse bucket, fed him, and watched. On a daily basis, I would tell Cowboy, “I think he’s dead.” To which Cowboy would come look, disturb the water, and sure enough, off Lips would swim. (Maybe I’ll start calling Cowboy the fish whisperer. I’m sure he’d love that.) Within a couple of days Lips was swimming around again. So now what’s a farmgirl to do? 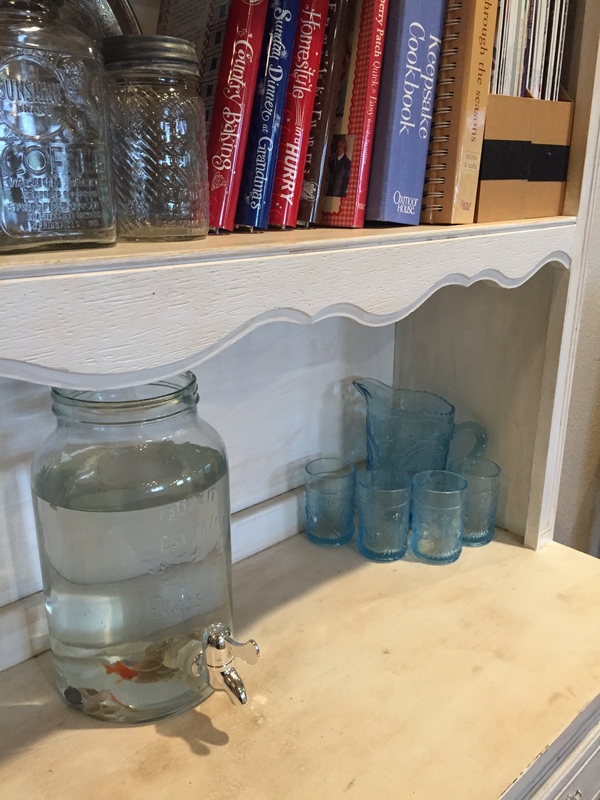 One fish + one tea pitcher = one very happy Lips the goldfish. A close up of dear sweet Lips, in his tea pitcher house. If you know me, you can most likely guess. He came inside, of course. But while I have kennels a plenty and horse halters galore, an aquarium is not standard farm paraphernalia. So digging through the cupboards I finally found it – my giant tea pitcher. And so with a few seashells from our travels dropped in for good measure, Lips was in his new home. And I prayed that the cats would not turn on the spout and drain out the water before Lips could have a real home. In addition, a girl can only give up her sweet tea pitcher for so long, fish or no fish. 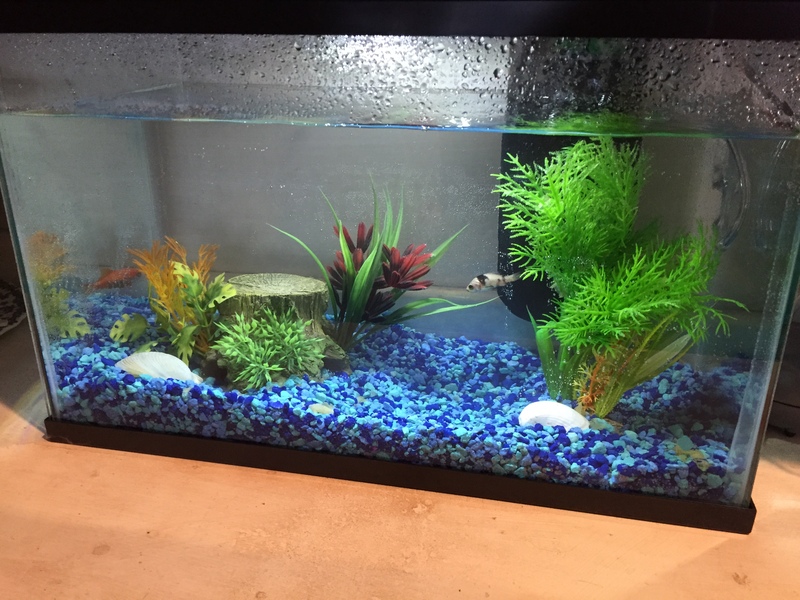 So long story short, Lips now has a home nestled in a lovely, proper aquarium, complete with air pump, colorful gravel, and decor. I mean the fish has to have style. 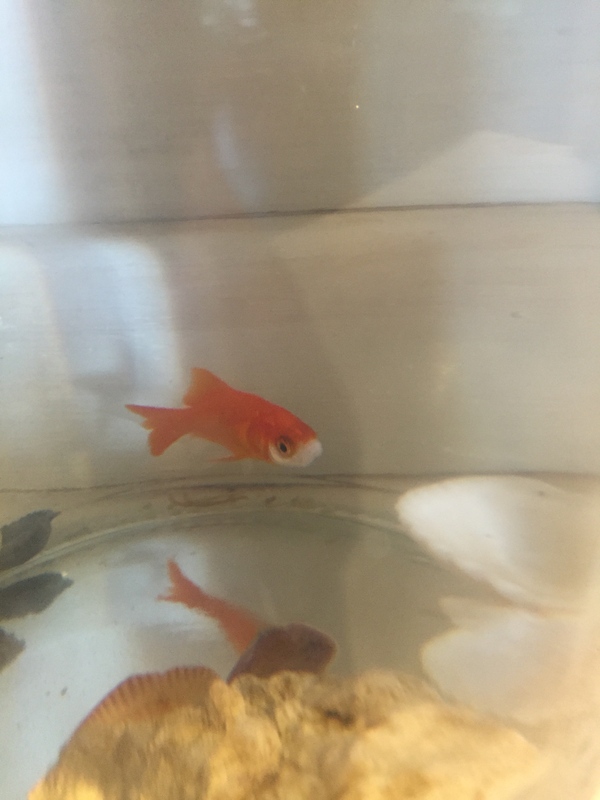 So if you are doing the math, this 32-cent goldfish now is a $50 investment, which leaves Cowboy scratching his head, but me able to sleep at night. And where is this aquarium, you ask? On my hutch, directly beneath my treasured cookbooks, where there will be no discussion of cooking fish. P.S. We originally got Lips a friend, who we named Stache, short for Mustache, as he had a black ring around has lips. But unfortunately, Stache didn’t last too long. Rest in peace Stache. We hope you enjoyed your time on the farm. Lips will remain an only fish for now. P.P.S. Goldfish don’t always do well in the troughs. So we continue to experiment and find the the right balance. We do enjoy having them and they are big help. If you give it a go, we’d love to hear your successes. This one is so cute to read. Thanks for brightening my day. Awe thanks. Makes me smile that it brightened your day. Let’s talk soon. Hugs back!